Sometimes good things lead to better things and that’s exactly what happened when these eggs made their way into yet another new dish. It was only last week that I discovered sunny side up eggs could be oven fried. From that great discovery, I made a few more. Sweet potatoes always go well with Brussels sprouts, in the same way they go well with kale. Eggs made in the oven take on a creamy texture and are just amazing. There is no need to ever splatter grease all the over the stove, when everything can be oven baked. Great meals can be made in 20 minutes. Eggs are good for dinner. I was home sick today and all I could find was a handful of Brussels sprouts and a small sweet potato. I sliced the Brussels sprouts and diced the sweet potatoes, tossed them with a bit of olive oil and put them in the oven for about 15 minutes. Last week I made the discovery that sunny side up eggs can be oven fried, and in the last five minutes of cooking, I added the eggs. I’ve put eggs with Brussels sprouts before when I made this potato cake with Brussels sprouts and a ruffled egg, so I am one to venture out with my sprouts and find a place for them besides a side dish. This was delicious and to make it even better, add in bacon or pancetta for extra flavor. To serve a crowd, increase the ingredients and add in more eggs. The flavor combination and the colors make baked eggs with sweet potato and Brussels sprout hash the perfect breakfast, lunch or dinner. 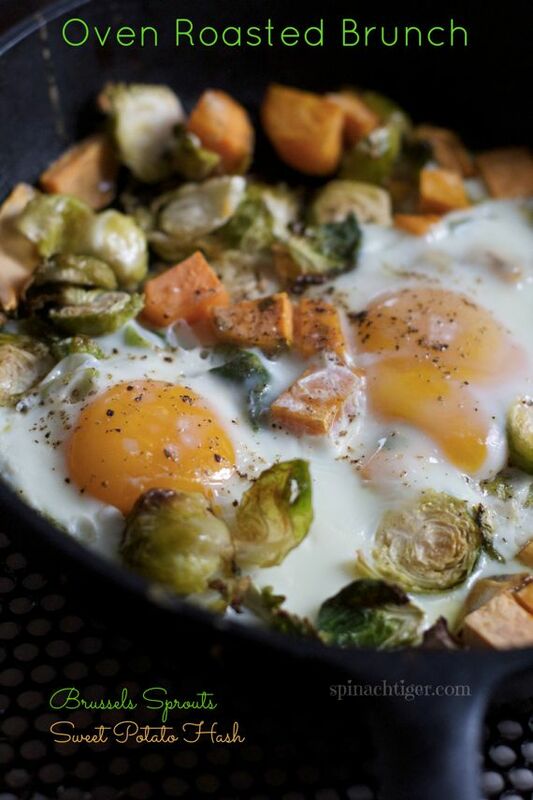 Sweet Potato Hash with Brussels Sprouts and baked eggs makes a great breakfast, brunch or even dinner. You can always switch brussels sprouts for broccoli, arugula, or spinach. Preheat oven to 400 degree, F.
Toss together sweet potatoes, Brussels sprouts, and shallots with olive oil and place in cast iron frying pan or small shallow baking dish. Cook for 10 minutes, tossing once half way through. Add eggs over the hash, and bake in oven for 5 to 7 minutes or until the eggs are done on top. Put the pan in the top third of the oven, so the heat will cook the top of the eggs. Notes: You can also spiralize or shred your sweet potatoes for this recipe. If you do, be sure to sauté on a lower heat. This sounds excellent and I would eat it for any meal of the day! Thanks Sylvie. I love breakfast for dinner too. Yes! I love baked eggs. 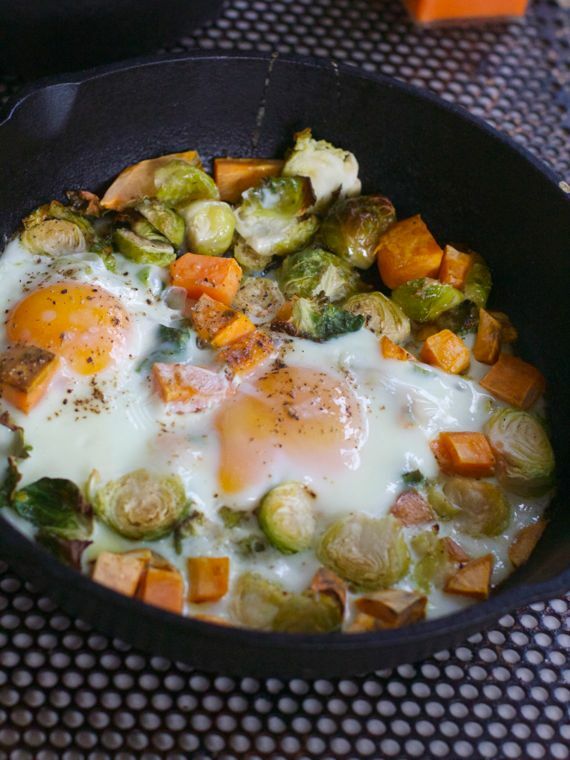 Angela, I think it’s fabulous that you used Brussels and sweet potatoes… such an interesting combo! And I’m with you I like the fast and easy one dish ease of roasting, makes me so happy. 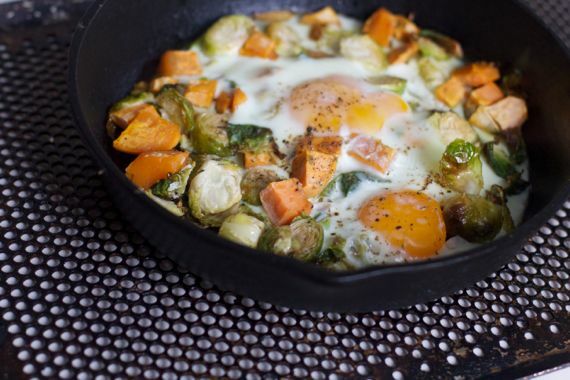 I know I would love this sweet potato hash with its creamy eggs and sprouts. What a beautiful brunch recipe, I could pour all of that gorgeous golden egg yolk directly down my throat! YUMMMM!!! You made me laugh. I feel the same way about egg yolks. I can only imagine how good eggs cooked in a wood fired oven is. G’day! Just finished brekkie, but could go for some of this, true! LOVE the idea of brussels sprouts hash too! I would eat this for breakfast, lunch or dinner – and preferably right now. Love this recipe! I’m making an old fashioned dry hash next week. They are all terribly good but sweet potato is a brilliant idea. In researching the post, I read that early 19th c hash was soupier and used things left over from a boiled dinner so had things like beets and turnips as well as potatoes. Give me brussel sprouts and sweet potatoes anyday! Thanks for that great info, Deana. It only makes sense to use what you have for a hash. Such a hearty and satisfying meal! Ashley, I hope you do try it out. It’s so good.